Welcome back everyone to our most recent edition of the Team Santa Inc. E-News. Today’s introduction is an LED Lighted Easter Basket Decoration for use both indoors and outdoors. A jumbo Easter basket that measure 30 inches by 50 inches. This large size decoration is almost 5 feet tall. Made of white, powder coated solid steel that looks great in the night as well as the day. The super efficient LED string lighting is meticulously pre-installed on the frame using little plastic clips that make each bulb point the same way for a stellar looking product. Extra bulbs and clips come with the decoration but more are always available at our website if you ever need them. This delightful new Easter decoration in our lighted outdoor Easter decorations product category. Don’t forget to get the 10% discount coupon code listed on the website and remember shipping inside the continental US is free while supplies last. Until next time.. Welcome back decorating enthusiasts to another fun look at the lighted outdoor Easter decorations that Team Santa Inc. makes available for sale. Today we have an absolute cutie for sure. The Easter Bunny Driving a Carrot Car is quite the hit. We are selling more of this decoration than we were before. It’s a big Easter decoration as it measures 30 inches by 50 inches. This outdoor lighted Easter decoration is just shy of 5 feet total. That’s a lot of LED string lights that are pre-installed on a white rolled solid steel frame. It’s a durable, high quality, outdoor Easter decoration. 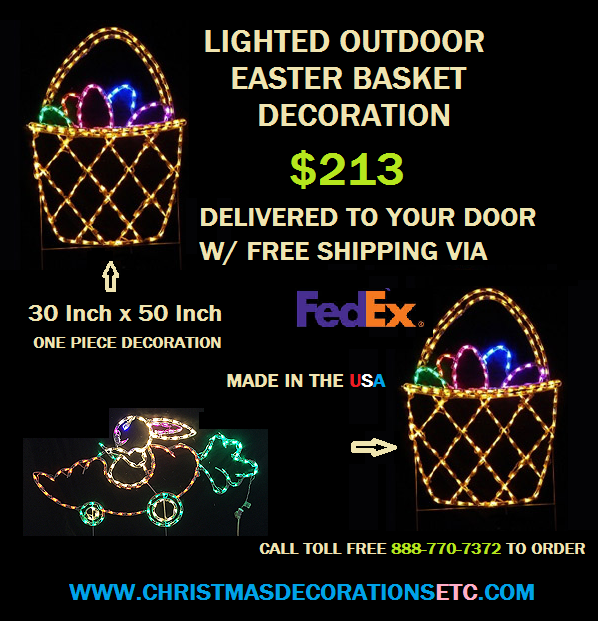 Order now and you’ll have your outdoor Easter decoration in one week. The longer you wait the more backed up the processing center gets and those are the people who make the product right here in the USA. 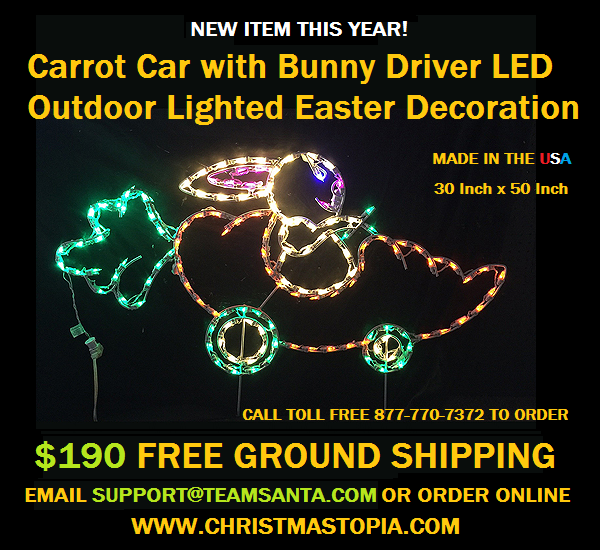 We absolutely guarantee that once you receive your Lighted Easter Bunny in Carrot Car Easter decoration, you will be completely satisfied. Bookmark this web site and stay tuned, because there is much more to come. We’re going to have fun! Until next time..
Hello to all of you decorating enthusiasts out there! I have some great news to share with you. It’s April and that means winter is out of here and Spring is in. Spring is a wonderful time of year and plays host to one of the most important holidays of the year, which of course is Easter. Today’s product introduction is an adorable LED lighted wire art frame of three colorful Easter eggs. The decoration is indoor/outdoor one piece and comes with posts for sinking the decoration on the front lawn. Very colorful with five different colors of LED string lighting pre-installed on this sturdy, high quality decoration. 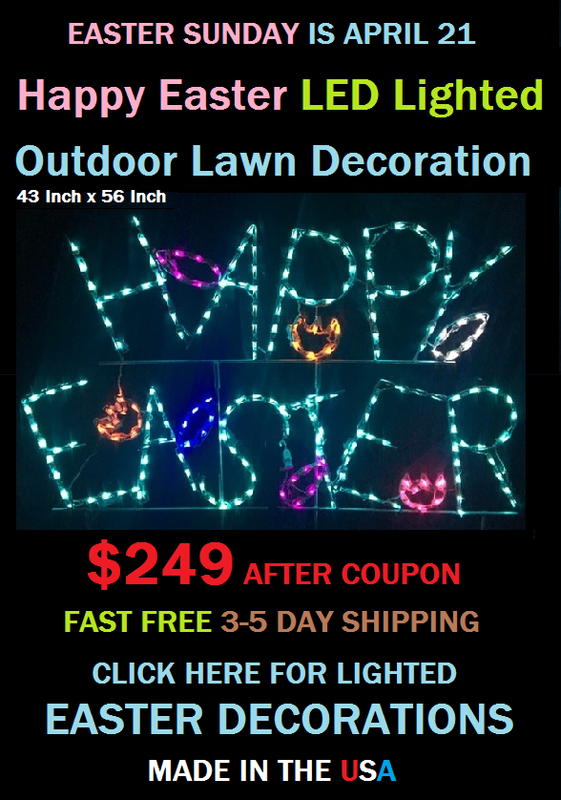 Be sure to check out our other great lighted outdoor Easter decorations. Free shipping on every decoration inside the continental USA. Get a 10% discount by using the coupon code currently available at the website. Let Team Santa Inc. Help you decorate your home or business during the spring time holiday season. Welcome back to another edition of the Team Santa Inc. E-News. Today’s introduction makes an ideal lighted outdoor Easter decoration. Made in the USA, the lighted butterfly glistens with hundreds of mini LED colored lamps, that are pre-installed on a white powder coated solid steel frame. Use the butterfly anywhere that you want to show off that Spring has sprung at your home or business. Each bulb is installed by hand and all the bulbs point in the same direction, which makes the color of the decoration really pop. The decoration is so bright that it looks absolutely wonderful in the evening hours. 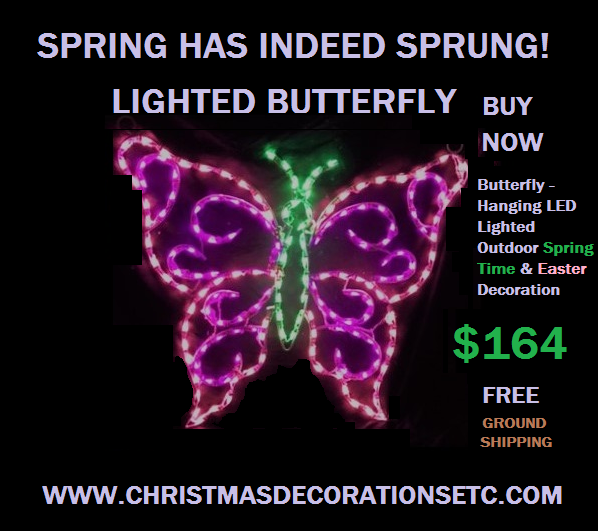 Make our Lighted Butterfly part of your Easter Decorations display. The butterfly is over three feet wide, which makes it pretty big. The actual dimensions are 37 inches by 39 inches. Green lights on the body glow funky LED green. Looks just like a laser. It’s really a very pretty lighted outdoor decoration. Order now and get FREE shipping. Plus right now you can get a coupon code discount with the FREE shipping. You won’t see that deal during the holiday shopping season. Easter will be here before you know it. This year treat yourself to one of our outdoor Easter decorations and show everyone that you are celebrating the Easter season. Until next time.. Welcome back to another edition of the Team Santa Inc. E-News. Today’s introduction is really lovely. It’s called the Praying Hands Lighted Easter Decoration. Carefully hand crafted and adorned with purple and white LED string lights, pre-installed on a powder coated white steel frame, this beautiful decoration can be used indoors or outdoors. Hang it inside your house of worship. It will look awesome! You can hang it on the outside of your church, etc. or use it just about anywhere where you want show that Easter is coming Sunday, April 21. Proudly part of this years Spring Time Easter Decorations selection. Try hanging it on your house. All you need is a cable tie or short piece of wire and a place to hang it. Looks absolutely stunning hanging off a deck, railing, garage door or even right on your front lawn. The decoration includes stakes so you can pitch the decoration just about anywhere there is dirt.‎ This Easter Decoration is only like six pounds and has LED lights all over it that use hardly any energy at all. 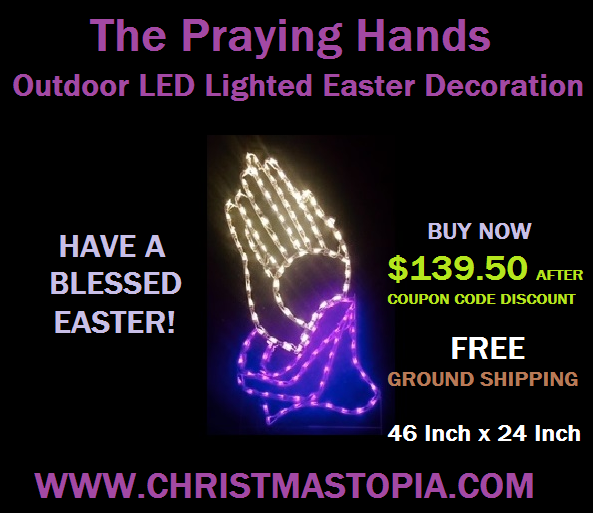 We don’t have many of the Lighted Hands Easter decoration, so if you would like to order one don’t forget to take advantage of the discount coupon code and the FREE shipping that is included with this offer. We hope you enjoyed our post about the Praying Hands. We will see you again soon. Until next time.. Welcome Back Decorating Enthusiasts to another edition of the Team Santa Inc. Decorator E-News. 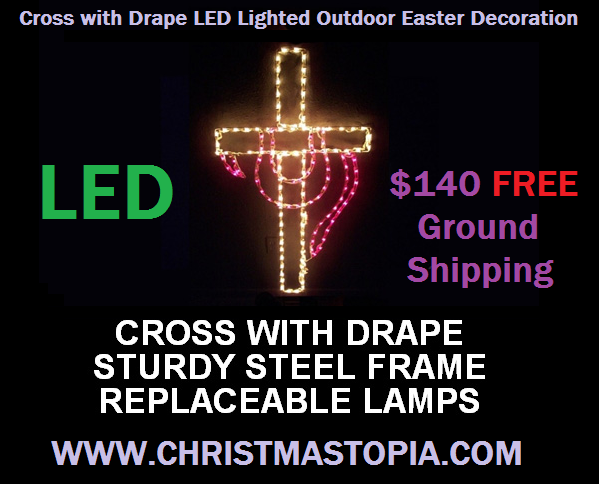 Today we have an absolutely beautiful new decoration called the ‎Cross with Drape LED Lighted Outdoor Easter Decoration. This lighted cross, just like the lighted triple cross, is a somewhat more religious piece than our other outdoor Easter decorations. It will look absolutely terrific wherever you decide to hang it. Because it’s not heavy, you can easily hang the cross just about anywhere with a piece of wire or a cable tie. 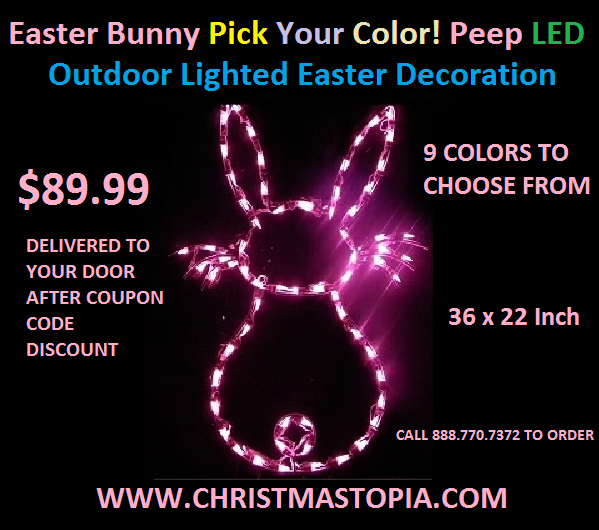 This lighted outdoor Easter decoration looks great on a home or a commercial building. Looks good hanging outside a window, on a railing, off a deck, on a fence, a garage, etc. You can also use the product indoors as well. Adorned with mostly white mini LED lights, this pretty decoration has purple LED lights woven through the cross to make it look as though the cross is draped in a purple cloth. This lighted Easter Decoration is quite sizable at 38 inches tall by 30 Inches wide, so it’s extremely versatile as to where it can be used. Obviously, this lighted cross will look ideal on the outside of a church or ministry. However, because LED string lights stay cool to the touch all the time, this decoration can be used inside a house of worship as well. LED lights use one tenth of the energy required by standard mini lights, so there’s no need to think your electric bill will go up because of this decoration. This lovely Easter Decoration is made of a solid steel frame, so in no way is it flimsy. It’s painted white and each LED string light bulb is meticulously clipped on the frame with each bulb pointing in the same direction. This makes for a uniformed lighted design that is definitely something to visually admire. The frame is white and so is the cord for the lamps. As a result, this decoration looks good in the daytime as well as the night time. It’s truly a nice looking, high quality product. Order now and you will have plenty of time to show it off during the current Easter season. We can only fill orders for this product while our supply lasts. Once we sell out, we will not have the decoration again until next year. If you’re interested, please don’t delay. Kindly allow approximately one week for delivery, once your order is placed. This high quality, sturdy decoration is made proudly in the USA. Additionally, there are more incentives that go along with this Easter Decoration, like FREE ground shipping plus a coupon code discount. Learn more about these incentives when you visit our website. We certainly hope that you enjoyed a preview of this delightful new lighted Easter Decoration. Should you have any questions at any time, please feel free to email support@teamsanta.com or call toll free 888.770.7372 to speak to a Team Santa Inc. representative. Our customer support staff is always happy to help you. Until next time..
‎‎Welcome back to another edition of the Team Santa Inc. Decorators E-News. Today we are going to show you an outstanding new indoor/outdoor lighted Easter Decoration. The new Lighted Triple Cross Decoration for Easter is a bit more religious than some of our other lighted outdoor Easter decorations. This high quality decoration which is made from a powder coated white steel bended frame, which will look awesome on the inside or the outside of a church or ministry. The lighted decoration will also look fantastic on the inside or outside of a parochial school. You can use the item at home or at your business. Use the decoration on your front lawn as it has stakes pre-attached to sink into the ground. You can also hang it on your garage, railing, deck, out a window or just about anywhere else, simply by using a cable tie or a short piece of wire to secure it. This Easter Decoration is not small. The lighted Triple Cross decoration is 38 inches tall by 31 inches wide, which makes it extremely versatile for use just about anywhere you can imagine. It’s lightweight design gives you a ton of flexibility regarding ways to use the decoration. It weighs less than six pounds. As an added bonus, this fabulous Easter Decoration includes FREE ground shipping via FEDEX 3 to 5 day service. Please allow one week for delivery from the time you order. You can SAVE extra $$ by using the current Team Santa Inc. coupon code for additional savings off the price listed online. Just check any Team Santa Inc. website for details. While at the website, be sure to check out all the ways you can make payment. Team Santa Inc. makes it exceptionally easy to place an order any time of day, seven days a week. Just visit the how to pay link at any Team Santa Inc. web store. Additionally, you will be pleased to learn that the decoration is made right here in the USA. We can only offer this delightful outdoor Easter decoration while our supplies last. Once we sell out, we will not be getting anymore this year. 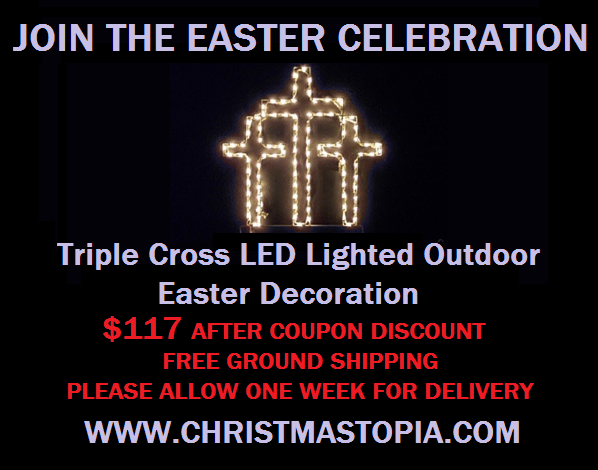 If you would like to order the indoor/outdoor lighted Triple Cross or any of our other lighted indoor, outdoor Easter decorations don’t delay. You’ll want plenty of time to show off the decoration before the Easter season ends. Should you have any questions, you can always contact our outstanding customer service staff by sending an email to support@teamsanta.com. For telephone support, please call toll free 888-770-7372 during normal business hours. Until next time.. Sounds of butterflies, flowers, birds, the list goes on and on. Many cultures worldwide embrace the Spring season as a time of rebirth and renew. In our country we share that same feeling. 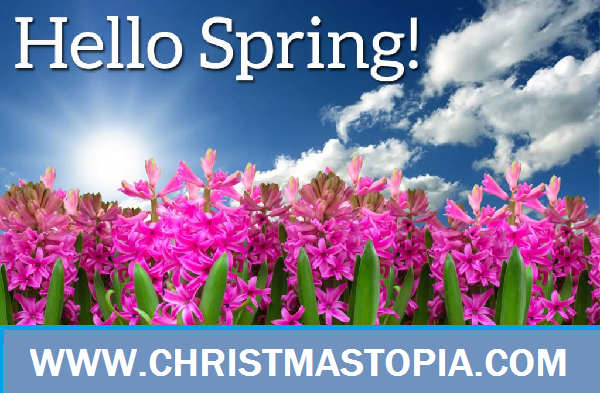 To help you celebrate, we have everything you need to get your home and/or business ready for the Spring season. When visiting please take a look at our new product category gardening. You’re gonna love it! 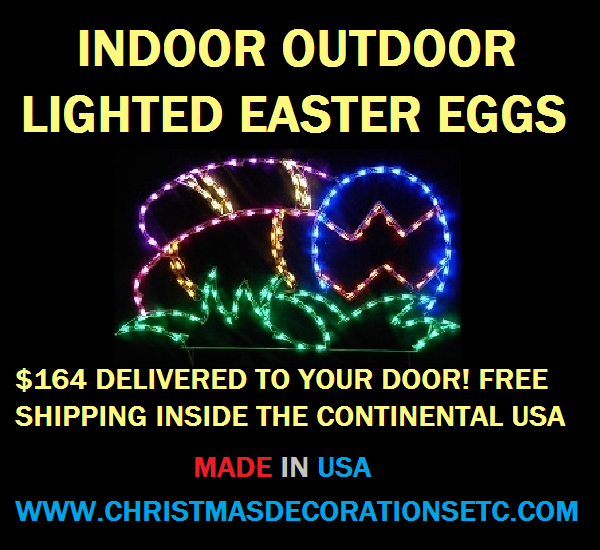 Additionally, we also have a wonderfully whimsical collection of LED lighted outdoor Easter decorations, designed exclusively for the Easter season and the decorations are made right here in the USA. How often do you see that anymore? We can PROMISE you that you will not be disappointed. Unbelievable customer service staff. Coupon code discounts and FREE shipping on outdoor Easter decorations.